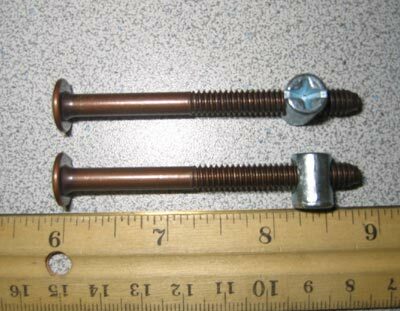 Futon Bolts 1/2" X 4 1/4"
1 Futon Bolt with Barrel Nut - These Bolts are Priced Each, and include 1 Barrel Nut or Cross Dowel with each Bolt. The Minimum Order is 2 Bolts, with 2 Nuts. They are used for connecting the arms of the futon to the long support, or stretcher boards. There are several different types of threads, so we sell them as a complete set. There are discounts for buying quantities.